The MINOR SCALE Event was a high-explosive test simulating the air-blast effects of an 8-KT nuclear weapon. MINOR SCALE was a high explosive (HE) test sponsored by the Defense Nuclear Agency. 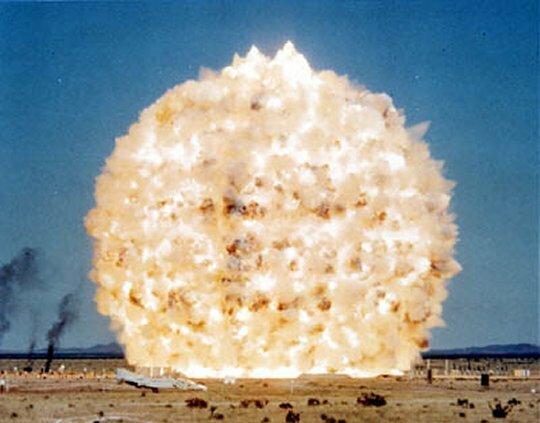 It was detonated at 1220 hours on 27 June 1985 on the White Sands Missile Range, NM. The explosive charge consisted of 4744 tons of ammonium nitrate fuel oil (ANFO) poured in bulk into a 44-foot (13.4-m) radius fiberglass hemisphere. The resulting airblast provided the scaled equivalent airblast of an 8 KT (33.44 TJ) nuclear device. 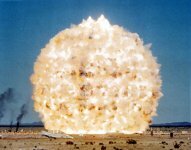 The primary objective of the test was to provide an airblast and ground shock environment for Department of Defense (DoD) sponsored experiments. These experiments were designed to determine the response of tactical and strategic weapon systems, communications equipment, vehicles, and a variety of structures to this environment. A secondary objective was to provide a simulated precursor environment for several other experiments. A third objective was to provide a thermal environment (in addition to airblast) for several experiments. The Federal Emergency Management Agency tasked the US Army Engineer Division, Huntsville, to design a keyworker blast shelter. In conjunction with this project, the US Army Engineer Waterways Experiment Station conducted a series of tests to investigate the effects of variations in weapon yield and the absence of wall stirrups on the structural response of a reinforced-concrete box-type shelter. The VSBS computer program was also utilized in these tests to confirm calculated yield effects on buried structures prior to the MINOR SCALE Event which took place in June 1985. Four 1/4-scale structural models were exposed to high-explosive tests simulating overpressures from approximately 1/2- to 10-KT nuclear bursts. Based on test results, the VSBS program appears to be an accurate method for predicting the variations in yield and overpressure which are required to cause a specified level of damage. Modification of the resistance function used in the VSBS program is required to better predict small plastic deformations. Test results showed that although wall stirrups may ot be required to prevent failure at the 50-psi level, including them ensures that the wall will not fail prematurely at slightly higher overpressures. A 100-man keyworker blast shelter was constructed and tested at the predicted 75-psi peak overpressure level in the MINOR SCALE Event in June 1985 at the White Sands Missile Range, New Mexico. The reinforced concrete shelter was designed by the US Army Engineer Division, Huntsville and the US Army Engineer Waterways Experiment Station under the sponsorship of the Federal Emergency Management Agency.^The experiment was conducted to verify the structural design of the shelter. The full-scale structure was complete with air-handling equipment, bunks, and instrumented anthropomorphic mannequins. The survivability of mechanical air-moving equipment inside the shelter and occupant survivability were investigated. The structure experienced minor damage during the test. Permanent roof deflections were 1/8 inch or less. The mechanical equipment incurred no damage, and in-structure shock in the shelter was within acceptable limits for occupants. The test indicated that the shelter will safely protect personnel when subjected to the design peak overpressure of 50 psi from a 1-MT nuclear weapon. Recommendations resulting from the experiment included the retesting of the structure using a High-Explosive Simulation Technique (HEST) test to introduce significant damage to the shelter.